Weight Watchers, eCommerce site & fulfillment maintained by FreshRealm. Weight Watchers (WW) offers various products and services to assist people, mostly women, with weight loss and maintenance. WW was founded in 1963, operates in 30+ countries and most recently is know for celebrity spokeswomen and shareholder, Oprah Winfrey. Help current WW members with their ongoing weight loss and maintenance goals by offering weekly prepared food delivery. Acquire new, younger members by leading the weight loss industry in offering fresh, never frozen, meal delivery to support behavior change for healthier lifestyles. 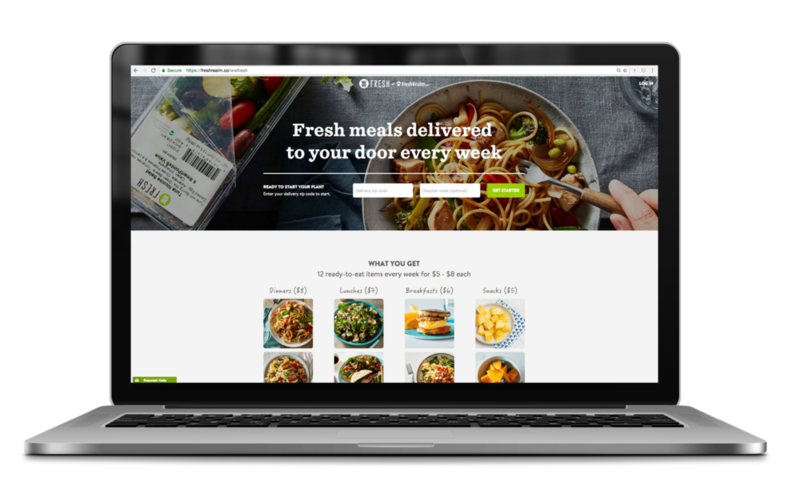 An eCommerce offering making it easy for WW members to sign up for and manage a weekly delivery of prepared meals, always fresh, never frozen. Implementation Phase 1 (2.5 months), first release of new UX, including code refactor & enablement of FreshRealm Product & Engineering teams to follow human-centered, lean and agile process. Developed a landing page to communicate the product value. Previously, no landing page existed. Simplified user flow by reducing a 10 page sign up and order management flow to 4 pages. Usability testing showed members intuitively and happily following the simplified flow. Reduced customer service calls regarding UX and Tech issues from 30% to 7% of call volume. Overall call volume significantly reduced. Improved average LTV from 3 deliveries to 5 deliveries per customer on average. Through this project, established a Product team for the eCommerce business unit by hiring a Product Manager and training a junior Product Designer to follow human-centered design process applied to agile process. Templatized a meal plan product that can be re-skinned for other partner brands to grow product sales and revenue. By refining team process through improved cross-discipline collaboration (PM, PD, Eng), decreased bug rate from 38% to 11%, allowing team to spend more time developing features to ultimately deliver business value.